Richard is an economist and fiscal policy expert with wide-ranging industrial and developing country expertise. He is currently Visiting Professor at the Duke Center for International Development and consultant for the Bill and Melinda Gates Foundation. He has recently worked as a consultant for the World Bank, Asian Development Bank, and Inter-American Development Bank. He retired from the International Monetary Fund in August 2008, where he ended a 24-year career as Deputy Director of the Fiscal Affairs Department. In recent years, Richard has worked on a variety of topics, including the fiscal consequences of financial globalization, debt sustainability, fiscal vulnerability and financial crises, fiscal responsibility frameworks (transparency, rules and independent fiscal agencies), accounting and reporting standards, public investment and public-private partnerships, and medium-term expenditure frameworks. A joint US/UK national, Richard has a BA from Sussex University and an MSc. and Ph.D from Stirling University. He has published widely on tax, social security, public expenditure, and other fiscal issues. He is joint editor of the International Handbook of Public Financial Management Handbook, which was published by Palgrave-Macmillan in August 2013. Sergio Schmukler is Lead Economist at the World Bank’s Development Economics Research Group. His research area is international finance and international financial markets and institutions. In particular, he works on emerging market finance, financial globalization, financial crises and contagion, financial development, and institutional investor behavior. He obtained my Ph.D. in Economics from the University of California at Berkeley in 1997, when he joined the World Bank's Young Economist and Young Professionals Programs. He has also been Treasurer of LACEA-the Latin America and Caribbean Economic Association (since 2004), Associate Editor of the Journal of Development Economics (2001-2004), taught at the Department of Economics, University of Maryland (1999-2003), and worked at the International Monetary Fund Research Department (2004-2005). He also worked at the U.S. Federal Reserve Board, the Inter-American Development Bank Research Department, the Argentine Central Bank, and visited the Dutch Central Bank and the Hong Kong Institute for Monetary Research of the Hong Kong Monetary Authority. Dr. LIU Zongyi, Research Fellow at the Institute for World Economic Studies and Centre for Asia-Pacific Studies, Shanghai Institutes for International Studies (SIIS). His research interests focus on Indian Economy and its Foreign Policy, Chinese Foreign Policy, BRICS, and G-20. In recent years, Dr. Liu published several papers in Chinese and overseas journals on these subjects. In the last three years, he published about 100 commentaries in Chinese or English newspapers. Dr. Liu got a B.A. in Economics from Shandong University of Finance and Economics and a diploma for Chinese and American Studies from The Johns Hopkins University Nanjing Centre. He obtained Master and PhD degrees in International Relations from China Foreign Affairs University. He also associated with the German Development Institute (D.I.E), OECD, and Centre for Strategic and International Studies (CSIS) as visiting fellow. Lant Pritchett is a Professor of the Practice of International Development at the Kennedy School of Government at Harvard University. In addition, he works as a consultant to Google.org, serves as a non-resident fellow of the Center for Global Development, and is a senior fellow of BREAD. He has held a number of positions at the World Bank and has been part of teams producing many World Bank reports. Professor Pritchett has authored over 50 papers and published his most recent book, The Rebirth of Education, in 2013. He received his B.S. in Economics from Brigham Young University and his Ph.D. in Economics from MIT. Siddhartha Chattopadhyay is currently working as Assistant Professor in the Department of Humanities and Social Sciences, IIT Kharagpur. He has a Ph.D. in economics from University at Albany, SUNY with specialization in macroeconomics and econometrics. He has received an excellence in teaching award and an excellence in research award from University at Albany, SUNY in 2010. He was also awarded a special fellowship for his doctoral dissertation in 2010 from University at Albany, SUNY. We propose that, the monetary authority adopt the inflation target as a time varying policy instrument at the zero lower bound (ZLB) with the same zeal with which they have adopted a fixed inflation target away from the ZLB. Specifically, after an extreme adverse shock reduces demand, the monetary authority promises future inflation by raising the inflation target in the Taylor Rule and announcing its persistence over time. The loss under our proposed policy is very similar to that under optimal monetary policy with the advantage that it is communicable using the language of the inflation target and implementable using the Taylor Rule. We also show that the inflation target and its persistence could be raised high enough to keep the economy away from the ZLB, but welfare costs are large. Gautam Bhardwaj is an Ashoka Fellow and co-founder and managing director of Invest India Micro Pension Services (IIMPS) and the non-profit microPension-VISA Inclusion Lab. He co-authored the Project OASIS report that provided the basis for India’s pension reform and the design for its National Pension System (NPS). He served as an advisor to the Government of India (1998-2010) and the Government of Nepal (2006-08) on pension policy, regulation, reform and implementation planning. In 2010, he advised the ADB on an institutional framework for regional cooperation on old age poverty issues facing informal sector workers in South Asia. He specialises in the areas of financial literacy, pension system architecture design and implementation. Nitin Chaudhary is the executive director of the Micro Pension Foundation and has overall responsibility for projects and research initiatives undertaken by the microPension- VISA Inclusion Lab in the areas of micro-payments, consumer financial services, behavioral finance and financial inclusion. He specifically focuses on the adjacencies between electronic payments and efforts to provide affordable, convenient and secure access to financial services by low income unbanked individuals. Prior to joining the Micro Pension Foundation, he worked at IIMPS, leading operations and strategic initiatives. He has earlier headed the product design and management functions at IFMR Rural Finance and was part of the core team that set up Kshetriya Gramin Financial Services Companies (shadow banking companies serving remote rural population in India). The majority of India's low income informal sector workers do not have bank accounts nor access to a secure micro-payment mechanism. This imposes several important constraints and risks in delivering long-term, contributions-based pension, insurance and micro-savings products to the millions of excluded poor. Also, the poor face significant challenges in providing valid ID documents prescribed by financial regulators while enrolling for formal financial products. This is often a result of insufficient or outdated identity documentation due to migration and other reasons. The problem of stringent KYC requirements is further exacerbated by a lengthy application and verification procedure involving the collection of multiple photographs and application forms along with physical verification of each application form against KYC documents. This causes significant cost and time overheads in processing individual “micro-pension” applications. The microPension-VISA Inclusion Lab has developed and field-tested an integrated solution that enables on-the-spot, cashless and paperless enrollments using eKYC and bank-issued prepaid cards in collaboration with the UIDAI and VISA. Gautam Bhardwaj from IIMPS and Nitin Chaudhary from the microPension-VISA Lab will briefly present the context and the solution at a seminar at NIPFP. The presentation will be followed by a live enrollment for NPS-Lite and UTI-RBPF to demonstrate the solution. Erik Berglöf is Chief Economist and Special Adviser to the President at the European Bank for Reconstruction and Development since 2006. He has previously held the position of Professor and Director of SITE at the Stockholm School of Economics. He has also taught at the Université Libre de Bruxelles and held visiting positions at Harvard, Stanford and MIT. He has published widely on financial development, corporate governance and transition economics. His interests have been particularly oriented towards policy issues in emerging economies, but he has also contributed extensively to the debate on regional and global institutional architecture. He has regularly provided advice to national governments and international institutions including the IMF and the World Bank. Erik Berglöf was the founder and President of the Centre for Economic and Financial Research (CEFIR) in Moscow and a Programme Director at the Centre for Economic Policy Research (CEPR) in London. He is a non-resident Senior Fellow at The Brookings Institution in Washington, D.C.
Jointly organized by Jawaharlal Nehru University (JNU), National Institute of Public Finance and Policy (NIPFP), and Faculty of Economics, Kagawa University. 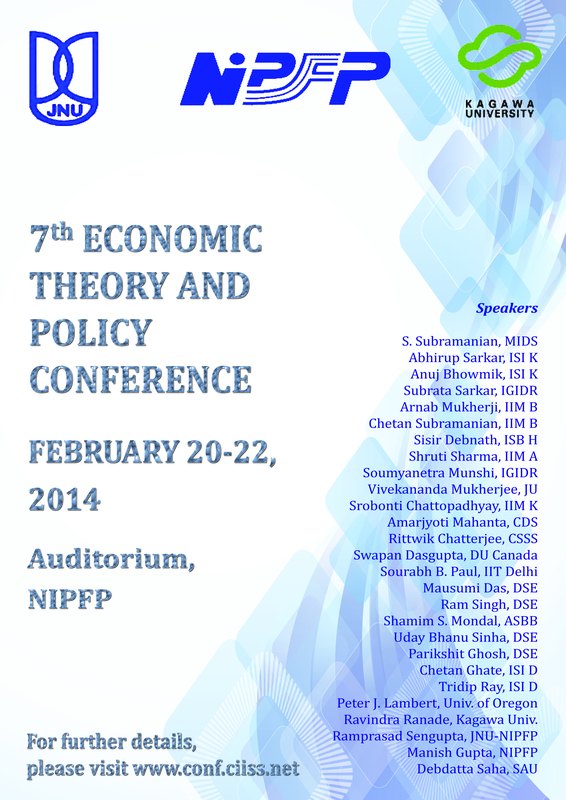 Conference Poster. On the Report of the RBI Committee on "Comprehensive Financial Services for Small Businesses and Low Income Households"
The RBI Committee on Comprehensive Financial Services for Small Businesses and Low Income Households was chaired by Dr. Nachiket Mor. At its core, the Committee makes the case for an approach that moves away from an exclusive focus on any one model linked to existing banks to one where new entrants are permitted and multiple models and partnerships are allowed to emerge, particularly between national full-service banks, regional banks of various types, non-bank finance companies, and financial markets. It recommends that every resident should be issued an Electronic Bank Account almost automatically at the time of receiving their Aadhaar number so that at least on this front it becomes possible to aspire for near universality over the next two years as the Aadhaar process completes its task. The Committee recommends that the RBI more rapidly license, with lowered entry barriers but otherwise equivalent treatment, more functionally focussed banks such as Payments Banks, Wholesale Consumer Banks, and Wholesale Investment Banks. These new bank types are the next logical steps in the transformation of existing PPIs (such as Airtel Money) and NBFCs, respectively. The Committee also recommends that the existing Priority Sector Lending (PSL) norms be applied in a such a what that they allow and incentivise providers to specialise in one or more sectors of the economy and regions of the country, rather than requiring each and every bank to enter all the segments, while ensuring that the banking system a whole delivers on the full PSL requirements. On customer protection, the Committee proposes a shift in the current approach to one that places greater onus on the financial services provider to provide suitable products and services.